At the very outset of our walk, we saw how the “modern” city follows the shape of the ancient Roman amphitheater. Today the weather is better: No rain is forecast, though the sky is rather heavily overcast. 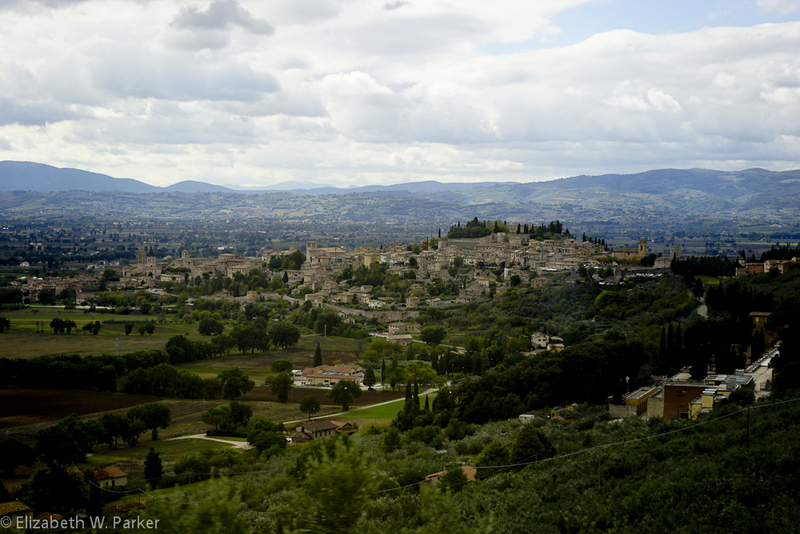 We were driven to Assisi, meeting our city guide, Laura, at the top of the city. Before I describe her commentary and our walk through the town, here is a map of Assisi, where I have starred the major sights I talk about. Please take a close look at the star farthest to the right and top. Can you see how the buildings are aligned to the Roman amphitheater ruins? Interesting how well you can see it in this view! With Laura’s excellent, sometimes comical, commentary we walked down through the medieval buildings, marveling at traces of the ancient Roman city as we learned about the history of the town. 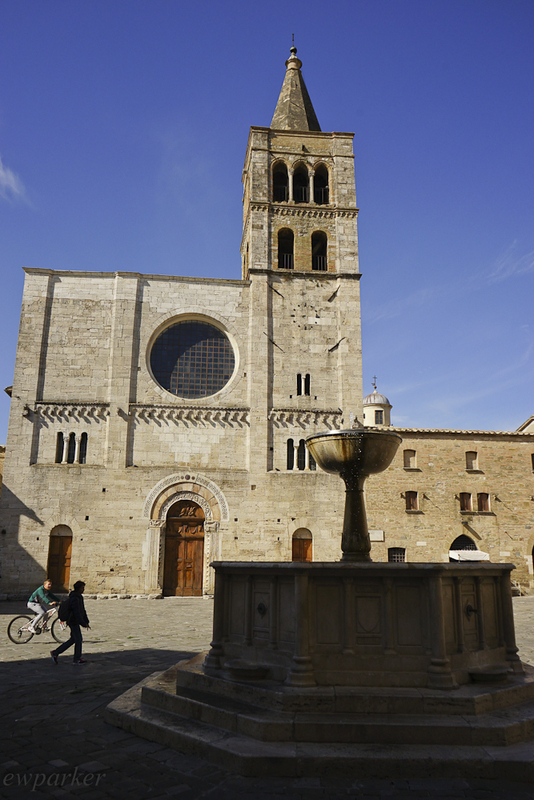 Our first stop was the Cathedral of Saint Rufino, where Saint Francis was baptized, and where we saw a crucifix with the image of a living Christ (a manifestation of early Christian theology in which Christ was considered completely divine and therefore not to have suffered in the flesh when he was crucified). Another interesting feature of this church is that through plexi-glass windows in the church floor one can see the stones of the ancient Roman forum, dating from the 1st century BCE. Isn’t this beautiful? 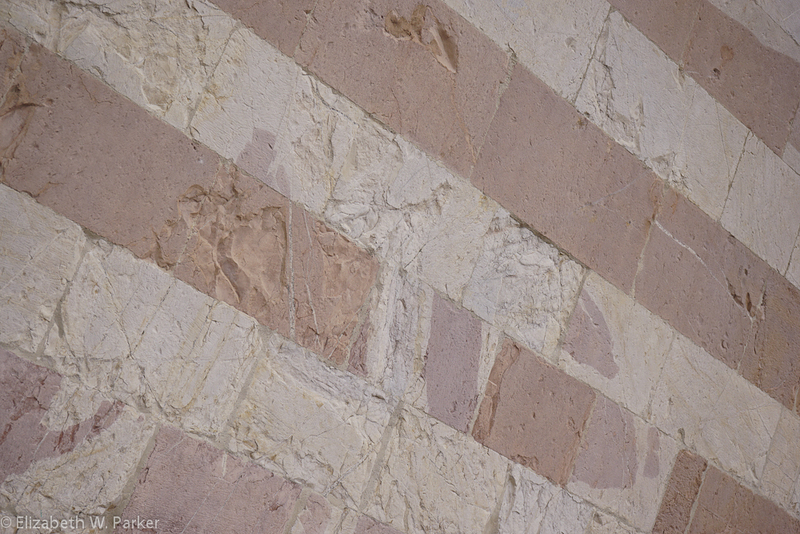 The pink stone is native to Umbria around Assisi. We also stopped at the Basilica dedicated to Santa Chiara (Saint Clare), Francis’s friend. Clare’s tomb is in the church, as are relics from both her life and that of St. Francis. 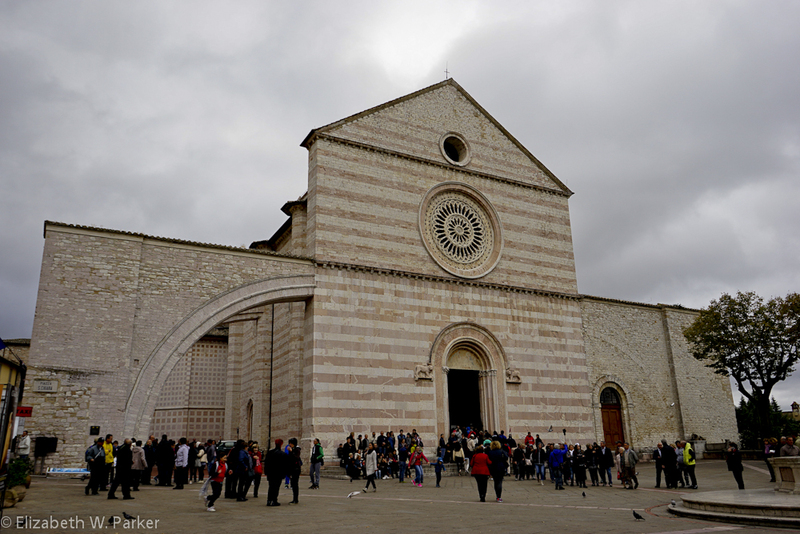 Basilica di Santa Chiara is made from the beautiful pink stone. We stopped about mid-walk and mid-city to see the remains of the Roman temple to Minerva. Of course, it was converted to a church, but we can be thankful that the facade of the ancient temple has been preserved because of this! 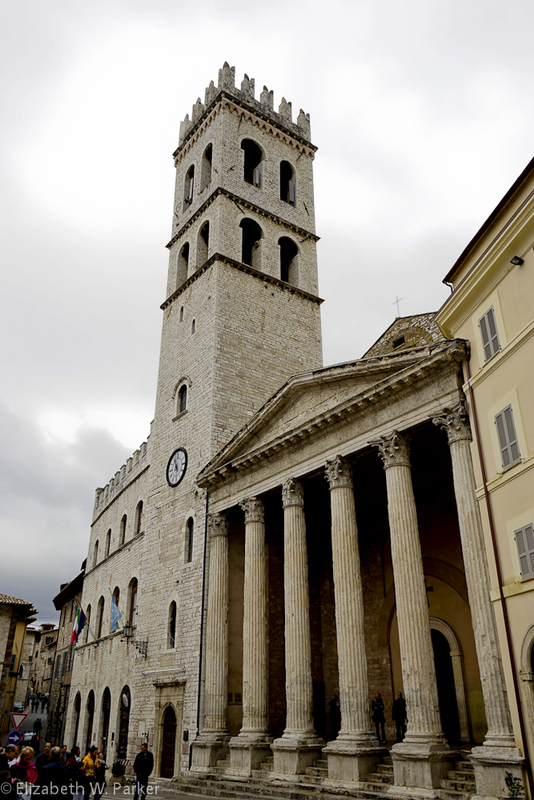 The facade of the Santa Maria sopra Minerva church is from an ancient Roman temple to Minerva. Across the street, very much in the “divine vs the profane” category, is the entrance to the ancient brothel! The vault paintings have recently been restored to their bawdy origins and they are pretty scatological! Not sure why that makes a man’s heart race … then or now! 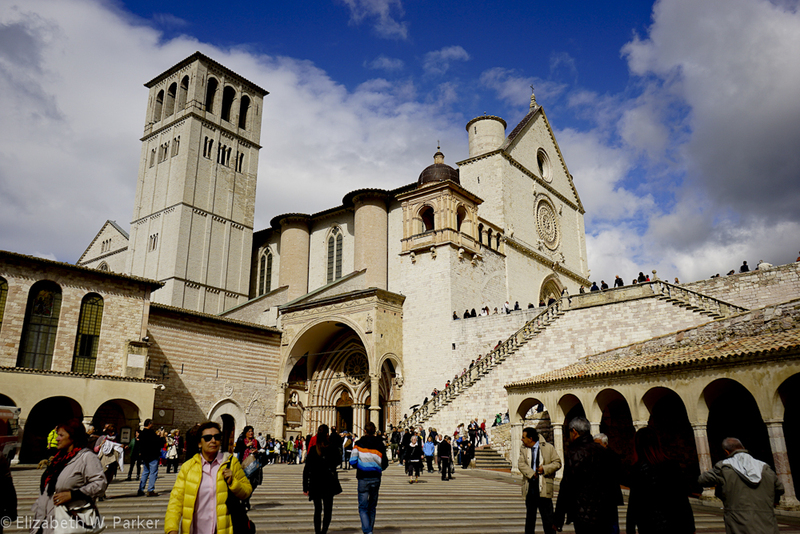 The highlight of the walk was certainly the arrival at the Basilica of St. Francis. A beautiful Gothic structure, it was built over a Romanesque structure that was erected within two years of Francis’s death. 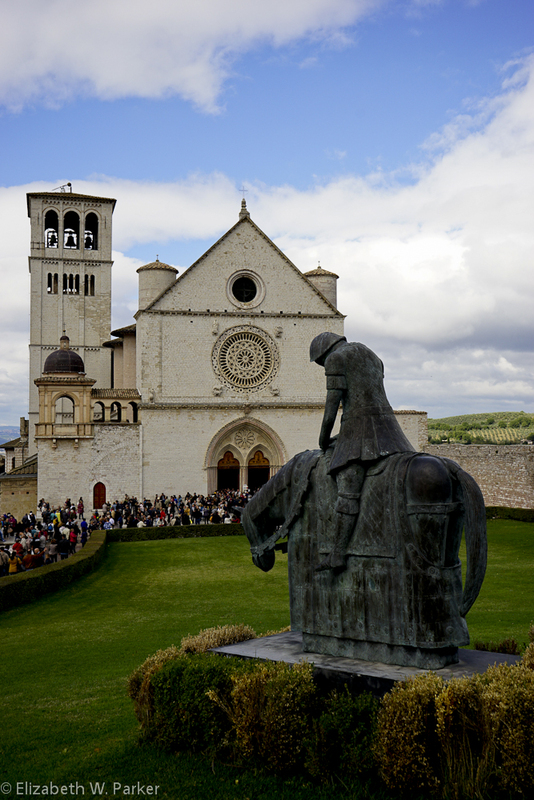 Facade of the upper Basilica to Saint Francis with the famous statue by artist Norberto. Looking at the upper Basilica from below. I only visited the upper structure and was deeply moved by the beautiful interior; the walls are decorated with frescoes by Giotto. We were not able to walk the length of the basilica to admire the frescoes and contemplate Francis’s life as the only people allowed past a certain point were those attending the mass. The crowds were not as bad as we feared. I am not sure if that was the hour (very close to lunch) or the imminent mass (everyone was inside sitting down for that). The dynamic plaza that connects the upper and lower basilicas. I am sorry I did not go to see the lower structure. My friend Galina did and said she enjoyed being able to walk right up to the altar and admire the architecture and the frescoes. After a rather short visit to this part of town, we completed our walk to the bottom where, upon exiting on the city gates, we found our transportation and headed off for lunch. Every meal has been a bit of an adventure! Today was no different. Assisi is located on the slopes of Monte Subasio, and driving around the mountain to the south, we drove back up a little way on the eastern side to a town called Collepino (hill of pines). How the world changes when the sun shines! This was along the walk to Spello. Up in Collepino (it got considerably colder), we had a wonderful meal in a pretty rustic place called Taverna di San Silvestro. Platters to share included roasted eggplant and peppers, bruschetta and mushrooms, even roasted pecorino! I had kid goat, Gerry had sausages, and others in the group enjoyed country style pastas and roasted meats. The place was pretty busy on a Sunday afternoon, but we had one of the rooms almost to ourselves (luckily for the other diners!). The experience reminded me of many Sunday afternoons I spent in Italy back in the late 70s when going out for a large meal on Sundays was the norm. We saw lots of families at the restaurant. Another view on the walk to Spello. View along the walk back to Spello. 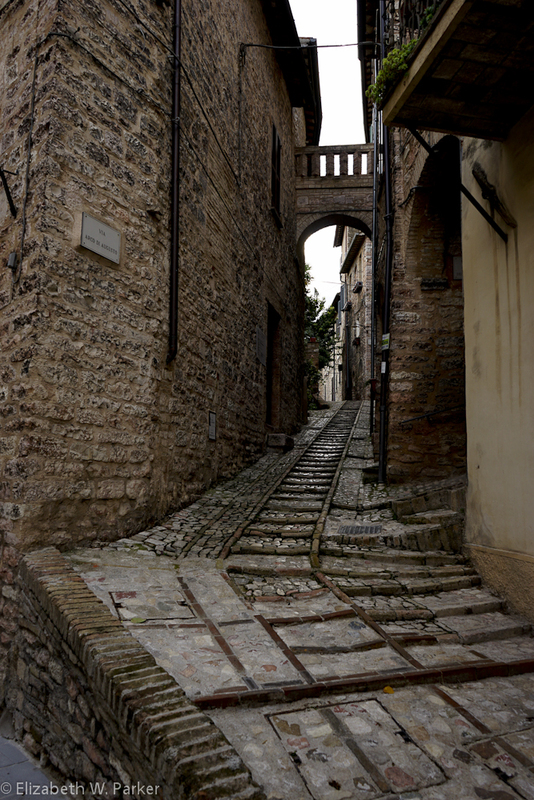 The last part of the walk was a steep upward climb on the cobbled stone streets within Spello’s walls. Our trip to the enoteca last night covered many of the same streets, but this afternoon trip was marked by the emerging of the sun and Sunday afternoon families gathered at the local bars. We saw lots of fixer-uppers. Hard not to dream as you walk. 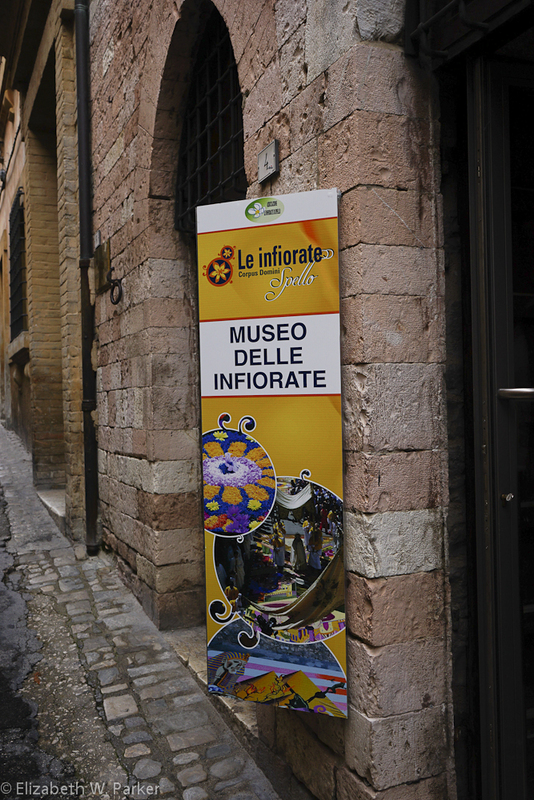 Galina and I walked a bit away from the hotel to find the museum of the “Infiorate”. This is a festival that happens in the late spring (the 6-7 of June in 2015, and the 28-29 of May in 2016), technically the 9th Sunday after Easter, for the feast called “Corpus Domini.” During the festival, elaborate images composed of flowers and flower petals are created in a processional route. Religious themes are the obvious order of the day. Here’s the video we saw at the museum. 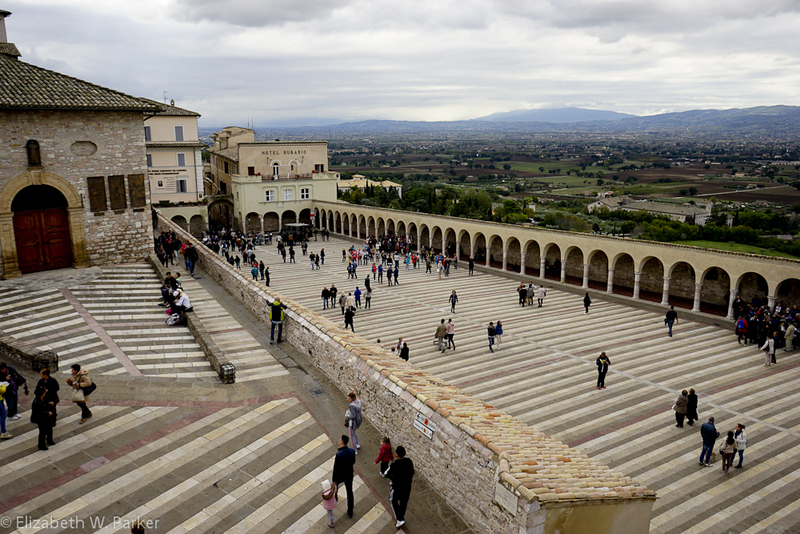 Might be worth returning to Spello to see, don’t you think? For our dinner, we walked back into the town of Spello to La Cantina, a really nicely decorated place where again we had a wonderful meal. Gerry and I shared an eggplant parmigiano appetizer that was superb, as well as a dove paté. For the main meal we shared a dish of the local pasta “strangozzi” (whose name comes from a shoelace used to strangle priests!) with pumpkin and veal cheeks, and a plate of dove roasted over a wood fire. Naturally, there was also an abundance of good wine and good fellowship! 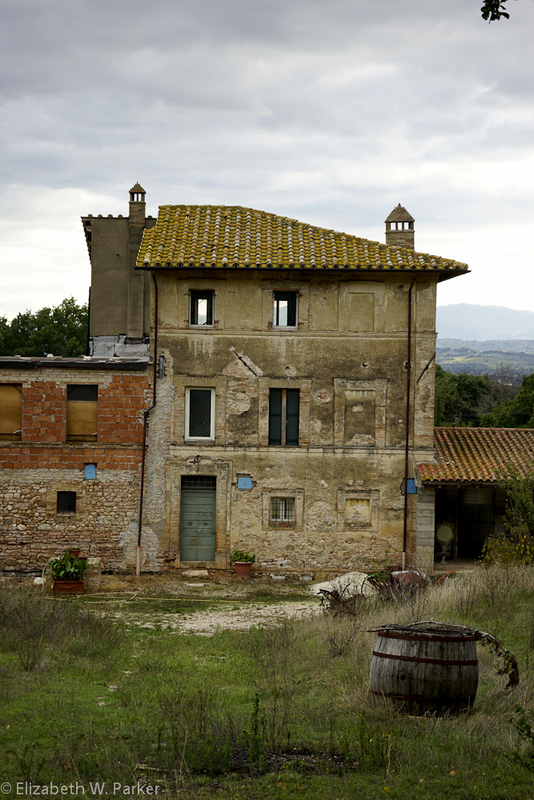 Good Morning, Umbria! A splendid day awaits. 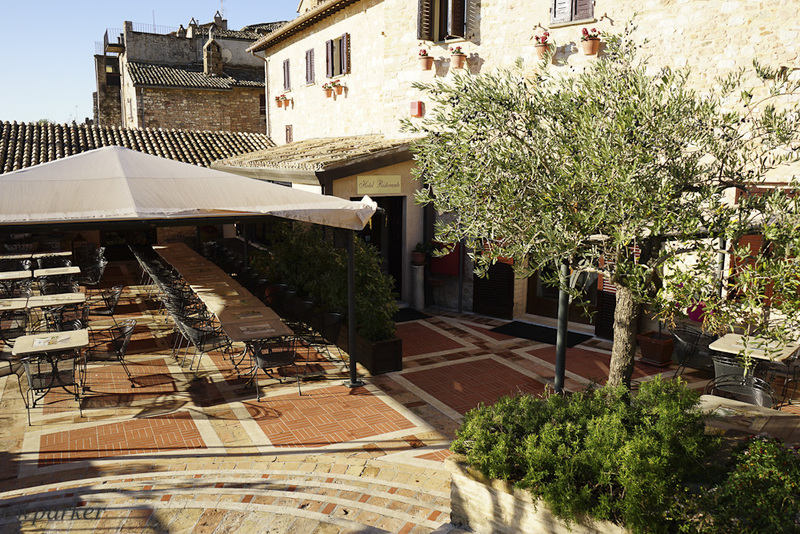 The patio of our hotel, La Bastglia. It overlooks the view above. Today was a good day for breakfast outside! We left our hotel in Spello, bags packed and in the bus by 9 to drive for about a half an hour to a town called Montefalco. 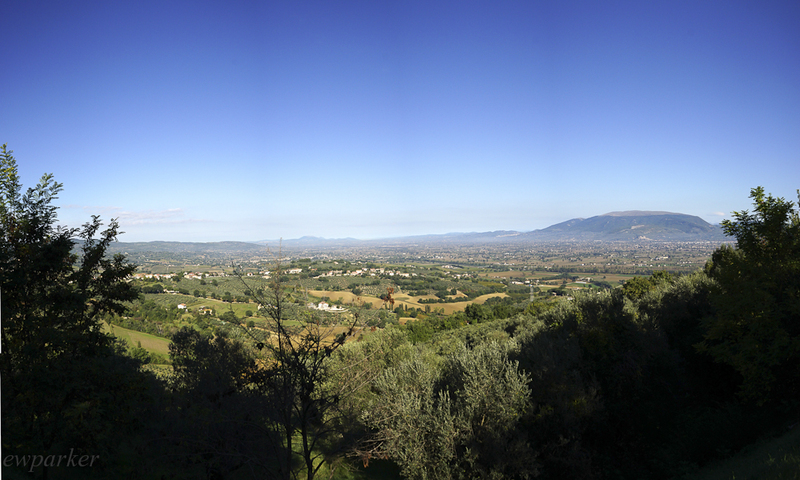 From here we set out on a 10 Km walk down the hill and into a valley carpeted with late season vineyards. Yellow and red and orange leaves were as numerous as green, there were some (practically raisin) grapes still on the vines, but we also saw occasional glimpses of fat, dark purple grapes in large bunches still waiting to be picked. The day was perfect! Cool at the outset, and steadily warming through the morning, a bright sun and blue sky accompanied us all the way. Valley view – sorry you are too far away and the image too small to see the towns I mentioned. From our starting point, and accompanying us much of the walk downhill, the views of the valley are tremendous. We can see Assisi, on the side of Mount Subasio, appropriately looking like a monk’s tonsure, We can also see villages like Spello and Collepino. The city of Perugia looms to the distant left. Squinting really hard, maybe we also see Gubbio on the distant horizon. 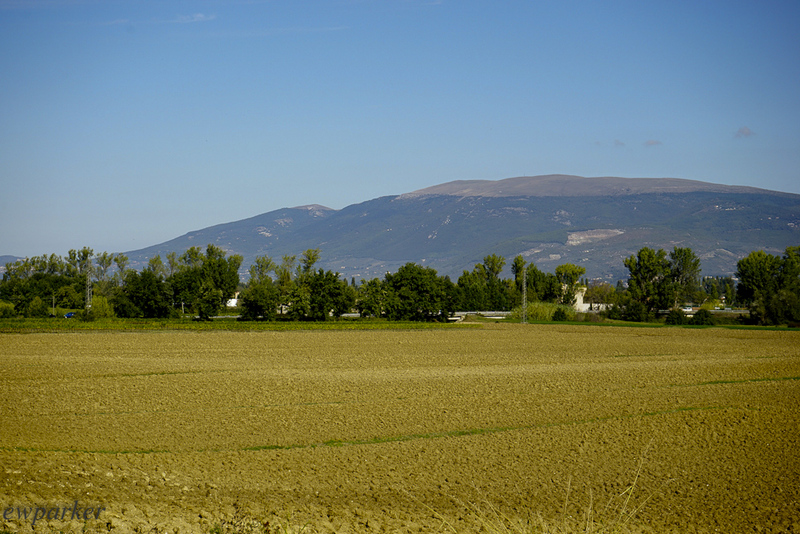 It is a patchwork of our walks, our meals, our days in Umbria. And I think I have given short shrift to the joy of our walking. We are 13 total members of this tour, and usually 11 of us are on the long walks. 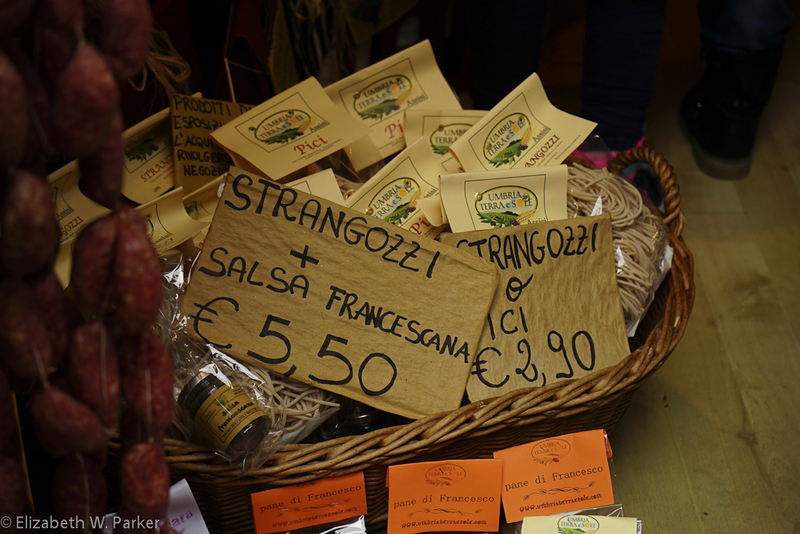 (Yes, you can come on the tour and not walk through the countryside: There are alternative activities – artisan visits, city museums, shopping. The walker, however, will experience the companionship of his/her fellows – talk of movies, books, careers and children, travel, childhood, politics and religion. Was I just lucky to have been plopped into a group like this? If it was luck, and I would question that, it was very good luck! The walker may also find some peace and quiet, some time to spend with him/herself as the countryside changes, admiring and wondering about the olives, the vineyards, the animals, the history – even the state of mankind! Despite the miles of walking, it was very relaxing, very restorative. Our entourage made friends with a little dog who followed us quite a ways, and who quickly disappeared when we cam upon a couple of hunters with much larger dogs. The hunters were looking for pheasants and hares; they were friendly, and charmingly got up! Fortunately most of our terrain was flat after the first descent, as it was a long walk and we arrived at lunch famished and achy! A Garden of Eden after walking 9 Km. The courtyard of the restaurant. By now I doubt I need to tell you that we had yet another wonderful meal. 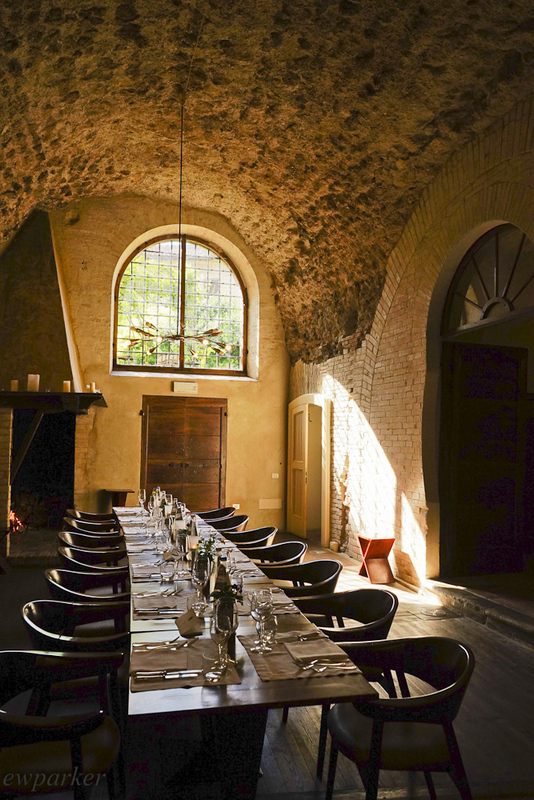 This time we were the sole guests of L’Orto degli Angeli whose restaurant is normally closed on Mondays. 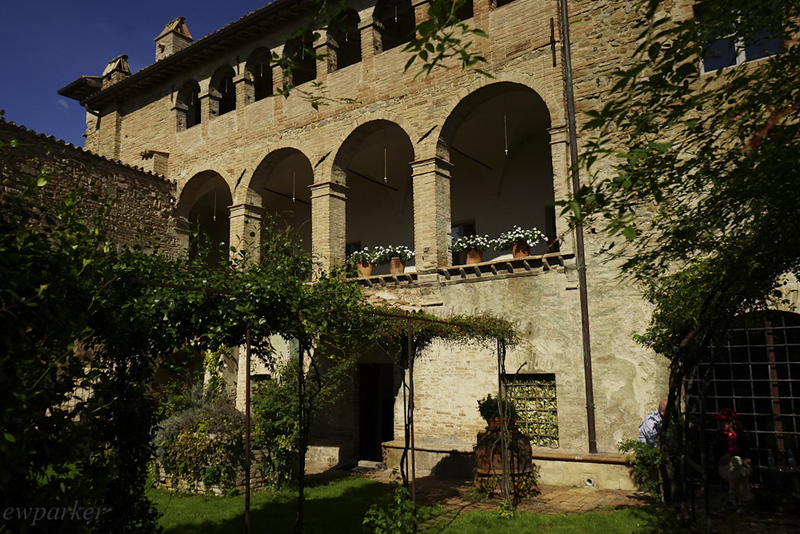 The restaurant (and hotel) is in the city of Bevagna, and wandering through the medieval streets, buildings all of rough-hewn stone and wood, we were not prepared for, though imminently pleased with, the green and flowered courtyard with prosecco and hot hors d’oeuvres. Our dining room! The Vault is the ancient theater. 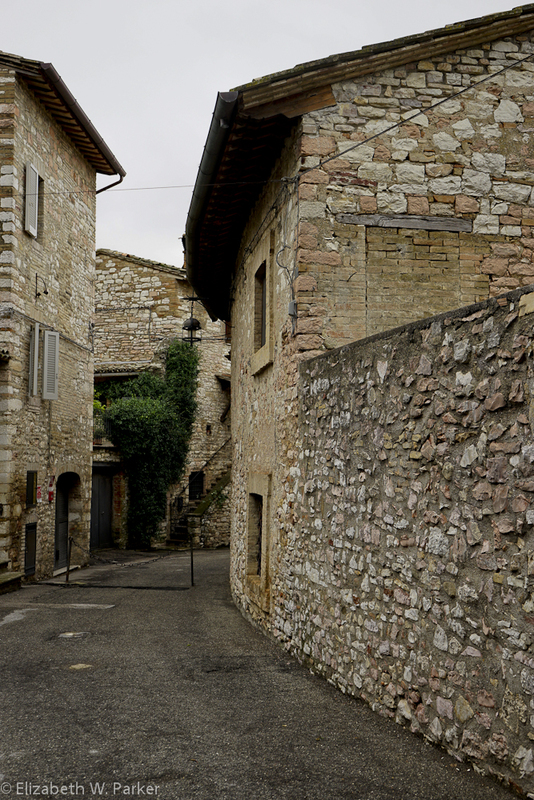 When seated in the dining room (we always eat at nice long tables – to fit the 13 of us all together), we found ourselves in the excavation of a Roman theater dating from the first century BCE when this town, Bevagna, was a metropolis of 30,000 people. The theater (and this was information we found out after lunch) held 10,000 spectators giving you an indication of the size and importance of the town. What remained intact over the millenia, was the vaulted area, probably the outermost ring of the theater wall. 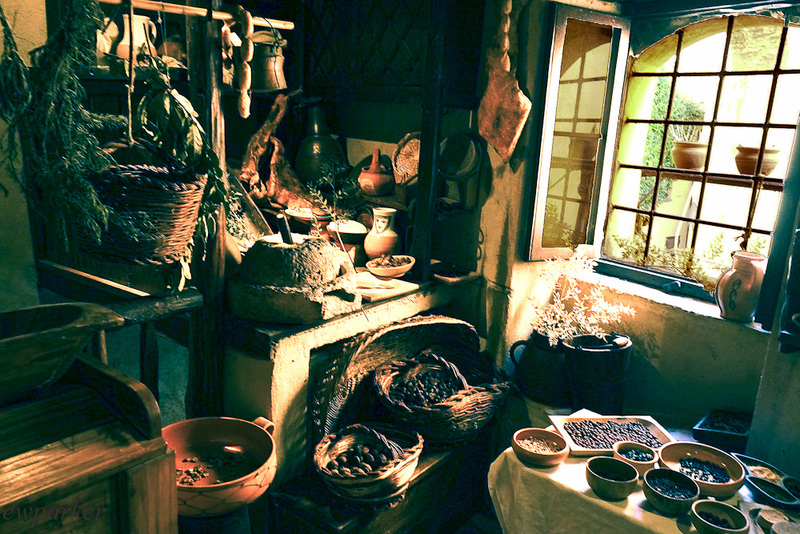 During the middle ages, shops were built in the lower level and dwellings in the upper. We actually got to see both areas. The dining room of the restaurant was in one of the lower level galleries, and we could still see the outlines of the arches and follow the big curve of the wall. Here our menu was a surprise even to our guides, and we were all served a delicious pecorino baked in puff pastry, served in a bean puree (I am sure it sounds odd but it was quite innovative and delicious. Strangozzi with ragu was our pasta course, roast pork with a delicate potato soufflé type thing (don’t you love my command of food vocabulary!) and an apple and ginger compote was the main. Our desert was a cake of cream and chocolate – a large portion that I just did not have room for but, nonetheless, managed a valiant effort! It was all very elegantly served, too. Pecorino in puff pastry and the bean puree. It was after this fine meal that we went next door to get the lowdown on the theater and the dwelling above it from a peculiar looking scholar with a flair for comedy! It was quite fun as well as informative! One thing we aren’t likely to forget: Red is the color of wealth and luxury! Can you see why we found this comical? It was informative but highly unusual. Kept us awake after a big meal! 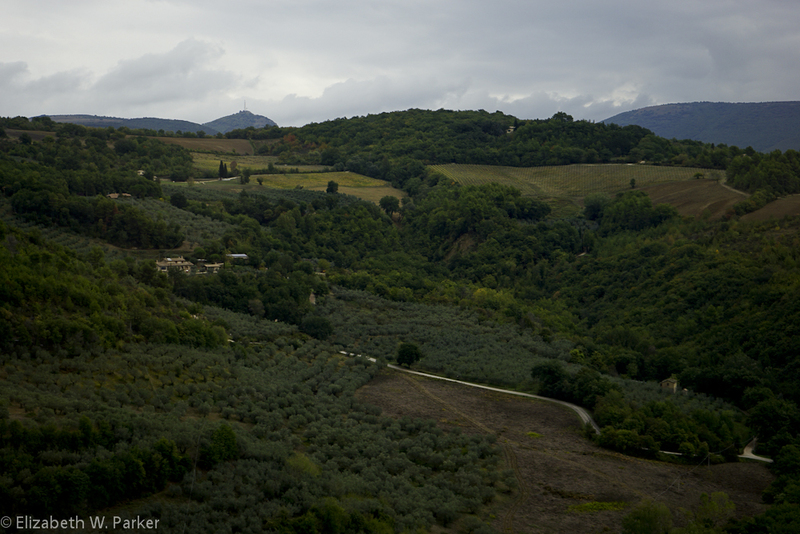 Next was a bus ride through the Umbrian wine country famous for Sangiovese grapes. Luscious landscapes, full of fall colors and texture were a balm for the eyes of those not asleep! We arrived about 5 at our final hotel of the trip, the Tenuta di Canonica near Todi. This display was set up in the living quarters created above the store, within the walls of the ancient Theater. 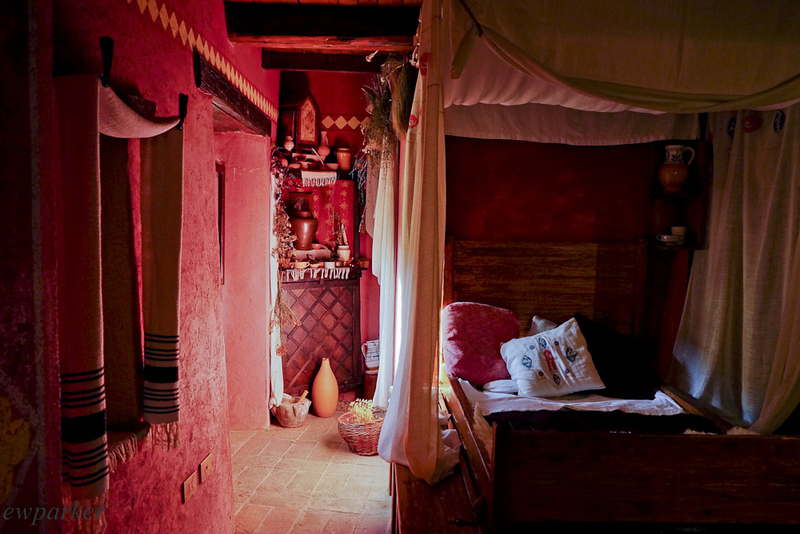 An example of what medieval homes would look like. Our hotel was the epitome of gracious living! Lovely common areas are very individually decorated, just like in a real home, complete with false family photos! 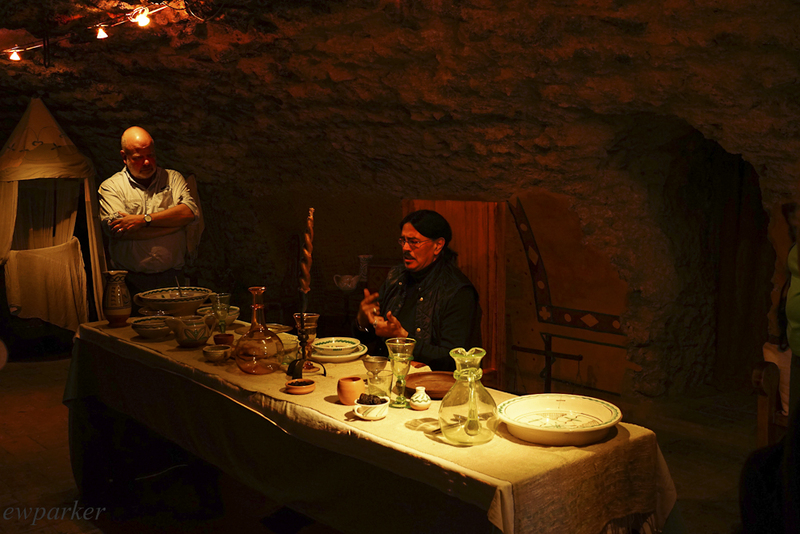 The first night we ate in a low-vaulted room, a long table set for the group. Our food is not made up of the traditional dishes of Umbria, rather a modern interpretation of the traditional ingredients. It is very good! At this point, the small portions are a blessing! 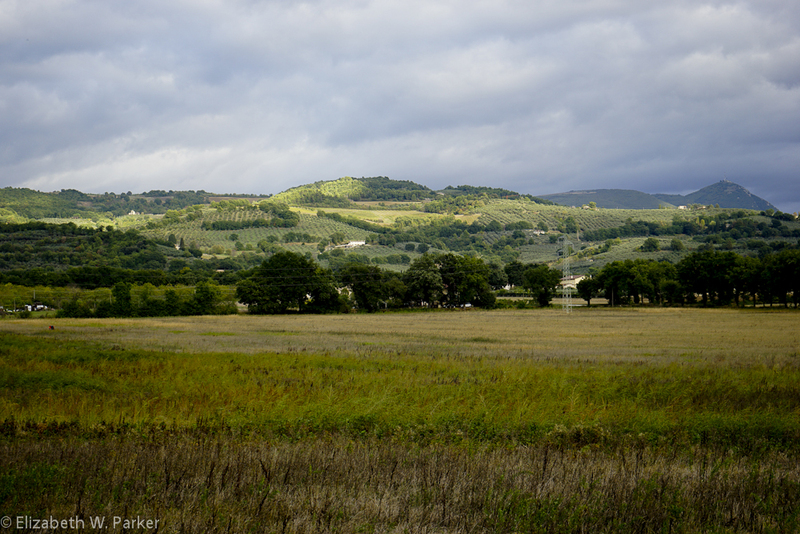 Keep going – still a few more days in Umbria and a bonus two days in Tuscany!